This chapter focuses on the politics of education as a basic human right. We analyze the challenges and opportunities implied in realizing the Convention on the Rights of Persons with Disabilities and operationalizing the human rightsbased approach to disability (HRBAD) with a case study on the inclusion of children and youth with disabilities in the regular education system of Ethiopia. The existing situation is highlighted with lived experiences of persons with disabilities and comments by organisations of persons with disabilities, education professionals, and government officials who were interviewed between August and October 2013 in Ethiopia. When successful, the HRBAD and its critical analysis bring about transformation in theory and practice. Inequality, however, may be reinforced or even increased unless duty-bearers in the Global South and North increase their capacity, dialogue and change their paradigm from ‘intervention effectiveness’ to ‘development effectiveness’, thereby encompassing inequality reduction as a central objective. This chapter concludes with an introduction of the promising role played by African persons with disabilities themselves through the newly established African Disability Forum in collaboration with the African Union and other international stakeholders. Abebe, W., & Woldehanna, T. (2013). Teacher training and development in Ethiopia: Improving education quality by developing teacher skills, attitudes and work conditions. Oxford: Young Lives, Oxford Department of International Development, University of Oxford. Retrieved February 4, 2014, from http://www.younglives.org.uk/files/working-papers/yl-wp103-abebe-woldehanna. Ministry of Labour and Social Affairs [MOLSA]. (2010). Baseline study on the status of persons with disabilities and the influence of the African decade pronouncement in Ethiopia. Addis Ababa: Federal Democratic Republic of Ethiopia. Retrieved August 11, 2014, from http://www.molsa.gov.et/English/SWD/Documents/Baseline%20Study%20Final%20report_ADDP.pdf. United Nations. (2011). 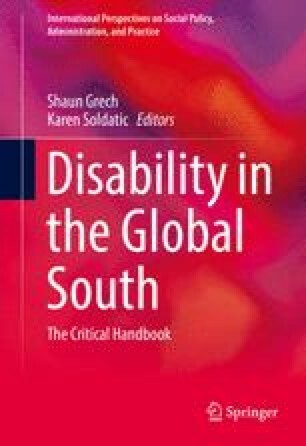 Disability and millennium development goals: A review of the MDGs process and strategy for inclusion of disability issues in millennium development goal efforts. New York: United Nations. Retrieved February 4, 2014, from http://www.un.org/disabilities/documents/review_of_disability_and_the_mdgs.pdf.